What is the Roboto art gallery? Since moving into our new space on Penn Avenue, Roboto has been lucky enough to have a front gallery space that is able to support monthly art exhibits. Every month on the first Friday of the month, there is the Unblurred gallery crawl along Penn Avenue and we unveil a new gallery exhibition. Visitors can also come in during any event at Roboto to check out the art in the front gallery space. 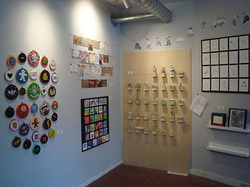 Roboto has shown a variety of different work including photographs, paintings, ceramics and more. If you are interested in showing your work, please fill out the form below. Be aware that Roboto is an active performance venue that specializes in punk rock, so take that into consideration if you are considering showing your work in our venue. We have luckily had few issues with work getting damaged in any way, but it is good to keep in mind. 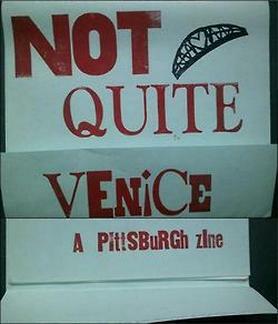 Zinebot, Roboto's zine library, is a collection of several thousand independently published publications. The zine library is one of the original project of Roboto but was forced into hiding for several years due to water leak issues at our old space. For years the collection resided boxed up in storaged. As we moved into our new space, a plan was made to revive the zine library. Currently a small curated selection of the overall collection resides in the middle hallway at Roboto (next to the bathrooms). A small crew of committed volunteers have been going through the full collection organizing it and more and more of the collection will be made available over the coming months. Want to show your art at Roboto? Fill out the following form. In a short paragraph, please describe the artwork you would like to show at Roboto. Please also let us know if there are specific months you are interested in showing your work.